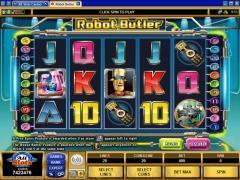 Robot Butler is a video slot game from Microgaming. As its name suggests, the slot has a futuristic theme. The reels are set in a science fiction kind of background and most of the symbols complement the theme. Robbie the Robot Butler is the wild symbol. The Tray is the scatter symbol and it is loaded with weird colored drinks in odd shaped containers. The House where the butler serves is also from the future. The other symbols are Car, Batteries and Phone. Of these only the Phone is styled in a futuristic manner. Bright colored high value card symbols from Ace to Ten also appear on the reels. These are crafted in keeping with the theme. 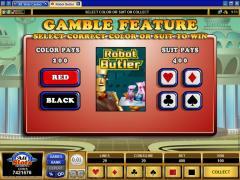 Robot Butler is a 5 reel 20 payline video slot game. Players can wager up to 20 coins per payline. The maximum coins that can be wagered per spin are 400. However the coin denominations are very low. The maximum coin size is only 0.10. Hence the maximum credits per spin are 40.00. This is unlikely to attract high rollers. The Robot Butler symbol substitutes for all symbols except the scatter symbol. It offers the highest fixed payout of 10,000 coins but does not multiply payouts. The Tray symbol offers scatter payouts when two or more appear on the reels. In Robot Butler the scatter symbols also have to appear left to right on the reels. A free spins feature is triggered when three or more scatter symbols appear on the reels from left to right. 12 free spins are awarded. The multiplier is decided by the player selecting one of the scatter Tray symbols. Multipliers up to 5X are randomly awarded. If three or more scatter symbols appear during the free spins, further 12 free spins are awarded but with the same multiplier. The Robot Butler feature is triggered when the Robot Butler symbol appears at the same time on Reels 1 and 5. The player has to select from three household items, pipe, key and newspaper. Robbie rushes off to fetch that item and returns with a covered tray. The cover is then lifted to reveal the item that Robbie has brought. If Robbie has got the wrong item the player makes a second choice. If Robbie has brought the right item any of the two times then the player can win up to 100 times the triggering bet. If Robbie fails both times then the player gets a consolation prize of 4 times the triggering bet. 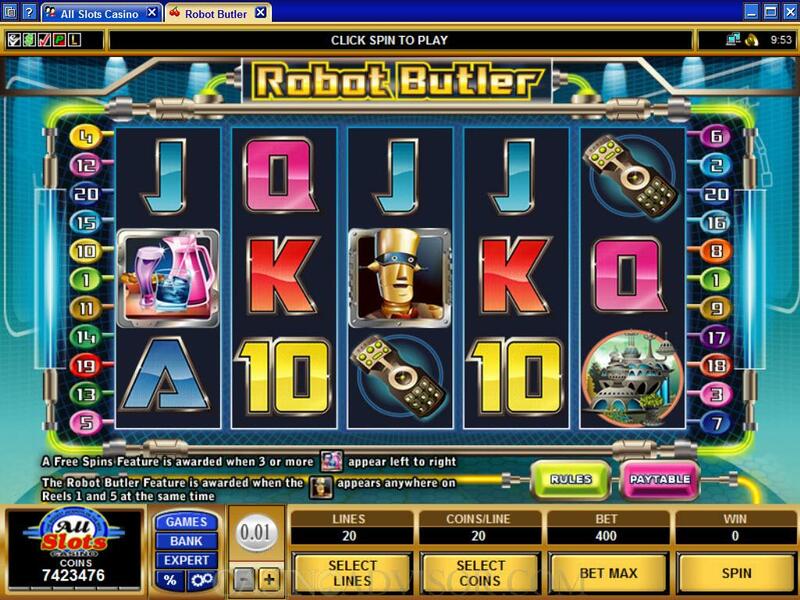 The Robot Butler feature can be triggered during the free spins. Robot Butler also has the Gamble Game in which players can try to multiply their payouts. Interested in reading more detailed information about Robot Butler? If so Click Here for more details.